Testing the notion that "I don't care if I ever get back..."
Losing a massive post like this to a browser crash is brutal. Just brutal. Here goes again, with condensed text and more photos, since the picture to word information ratio is said to be 1000:1. 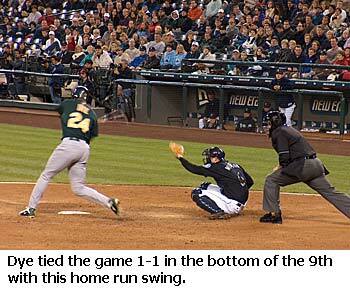 Monday night, Eric and Christina took me to the Mariners game. 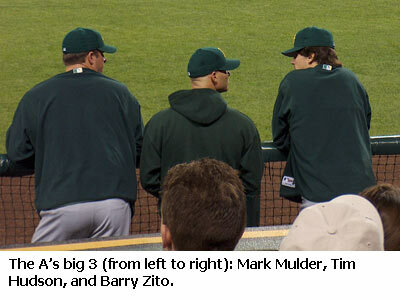 They scored Eric's manager's sweet seats, just a few rows behind the visiting A's dugout. 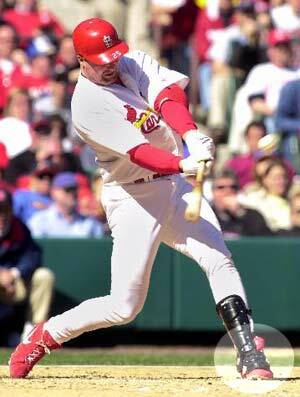 ...and the batter's box. 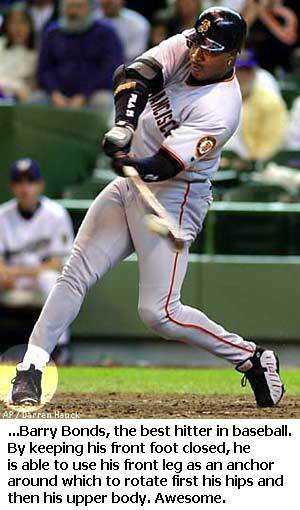 I could admire Edgar's swing up close and personal, and it does share some qualities of some of my favorite swings in baseball (it's sad that I've learned more about the baseball swing studying books these past two years than I did in several years of Little League as a child). 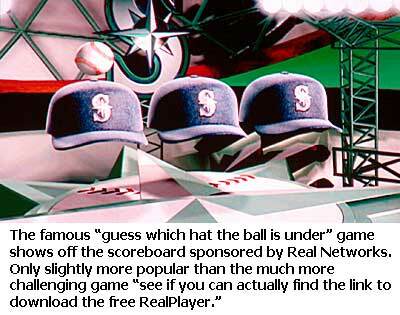 Safeco offered its usual lineup of sights, including Ichiro, Freddy, Johnny O, and the ball-in-hat scoreboard game.. But this game had a few tricks up its sleeves, and long sleeves they were. 14 innings long. 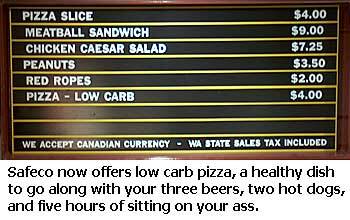 For example, the concessions stand now offers low-carb pizza. What is that? Do they just hand you an empty cardboard box with a few dabs of spaghetti sauce and cheese in it? 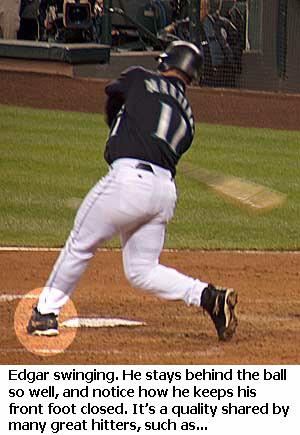 We also got a view of new Mariners LOOGY Mike Myers. 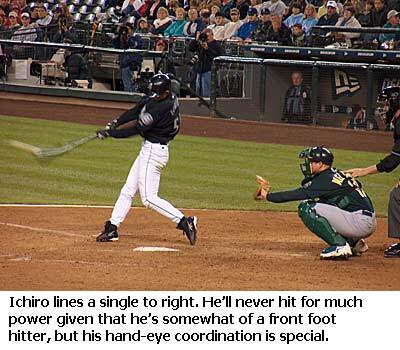 He is a novelty in that he throws both overhand and submarine with about equal frequency. If his arm doesn't fall off, he'll be making decent cash for years. Want your son to earn a good living? 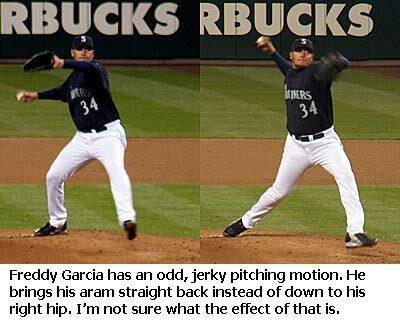 Teach him to throw lefty and sidearm. In about twenty years he'll be getting the call to come in to retire a 60 year old Barry Bonds. Another momentous occurrence, courtesy of our advantageous positioning: Christina could run up to the railing between innings to plead for a ball from the A's coaches and players. Is there a more win-win form of charity than the donation of baseball from professional player to fan? Never has more happiness been created than when a pro baseball player discards a baseball by tossing it to a fan. I saw a grown adult dive over two seats to try and snag a foul ball, bloodying his nose on a seat back in the process. All this over a dirty sphere of leather and yarn that costs $5 in the pro shop. 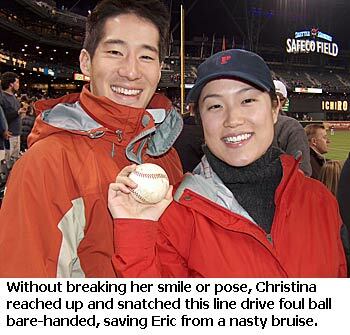 Lo and behold, Christina finally received one from an A's coach, the ball the A's infielders had used to take grounders after taking the field in the bottom of an inning. 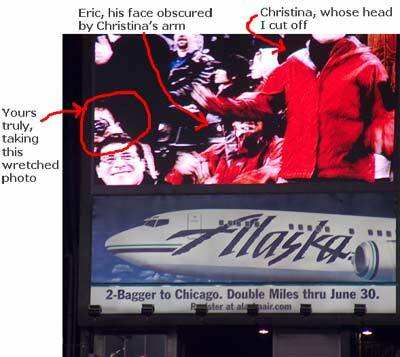 Christina, usually underwhelmed and collected, jumped up and down screaming for a good two minutes. Compare her reaction to that of the young boy with a glove sitting in the front row. He received some seven or eight baseball purely by the virtue of his youth, yet he regarded each with the same jaded, gluttonous gleam in his eye. Not endearing in a nine year old, and I contemplated assaulting him outside the stadium and robbing him of his collection just to teach him to appreciate his bounty, but the game went on so long I forgot my plans. 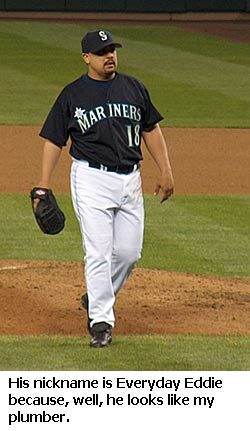 New Mariners closer "Everyday" Eddie Guadardo came in in the 9th to preserve the 1-0 lead, promptly serving up a home run to Jermaine Dye to send us into extra frames. Things got weird. A's CF Mark Kotsay got tossed for arguing balls and strikes, so the A's moved All-Star third baseman Eric Chavez to left field. 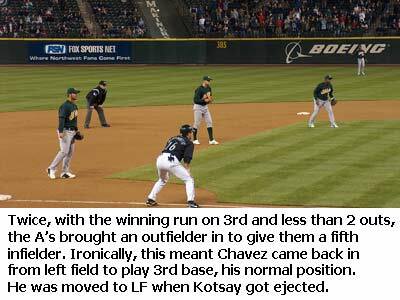 The Mariners got men to third with less than two outs twice in extra frames, causing the A's to then bring Chavez back to third base to give the A's a five infielder, two outfielder alignment. The M's failed to capitalize. 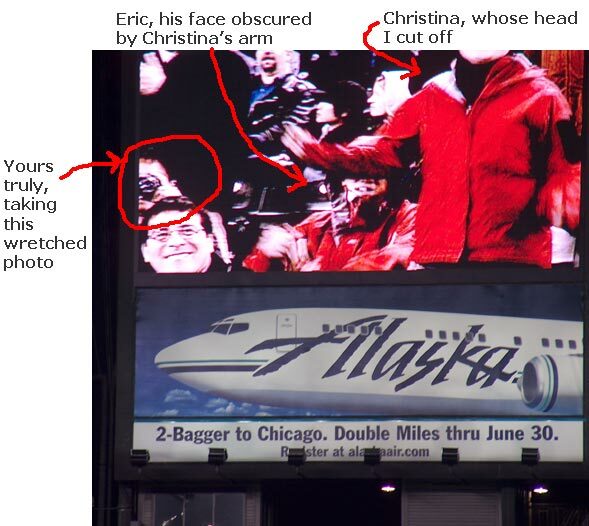 Eric, Christina, and I made it onto the jumbo scoreboard three times. The one time I was able to get my camera pointed quickly enough to fire off one shot, I made the cardinal rookie mistake of looking up to see myself, causing me to move enough to cut off Christina's head. The dreaded digital camera shutter lag also caused me to take the one shot where all three of our faces were obscured. It takes skill to fire off a photo this poor. 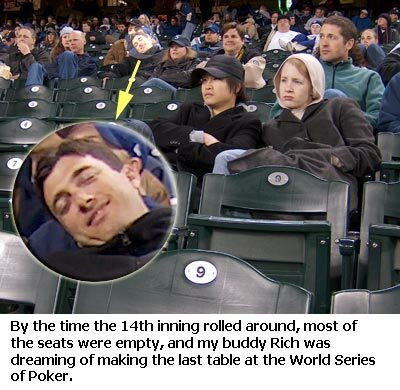 By the 14th inning, Rich, who was sitting about ten rows in back of me with some clients of his, was struggling to stay interested. Most seats had emptied out, but staying to the bitter end of an extra innings game is a matter of pride. 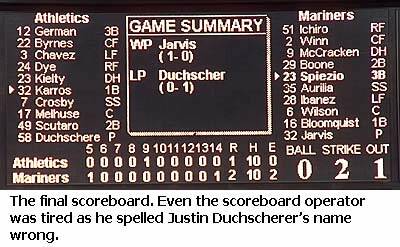 Finally, mercifully, pitcher Justin Duchscherer of the A's balked in the winning run in the bottom of the 14th inning. 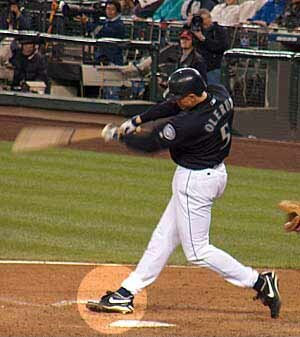 Some 4 hours, 47 minutes after the first pitch, perhaps Duchscherer simply needed to get some sleep. Maybe that Mexican lunch he had was knock knock knockin' on heaven's door. 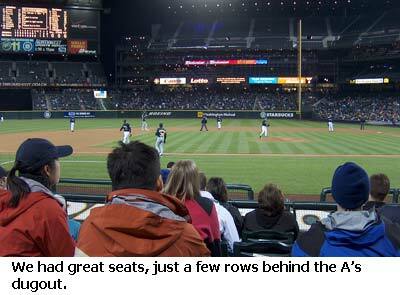 The remaining fans, all seventeen of us, staggered out into the cold Seattle night.